Looking for a statement that's sophisticated, daring and modern? 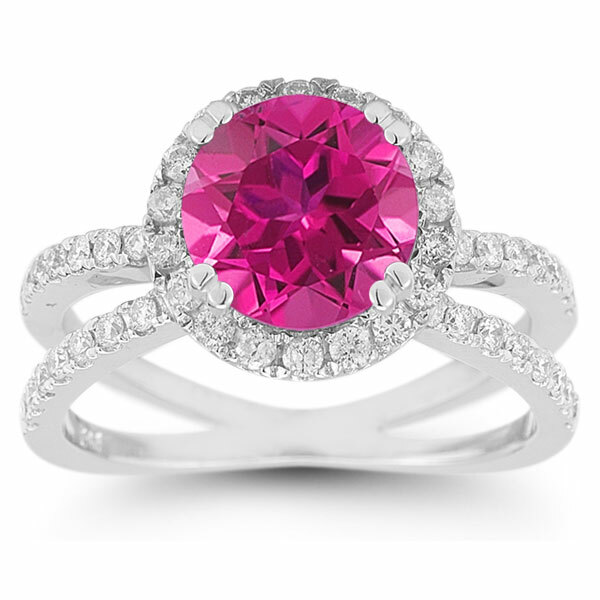 Then don't pass by this stunning Pave Diamond Criss-Cross Pink Topaz Halo Ring! With its unique intersecting bands, a semiprecious gemstone that refuses to be ignored and 0.74 carats of diamond accents, this is a style that's impossible to miss, and it stands out for all the right reasons. Two criss-crossing bands of 14K white gold provide the contemporary foundation for this updated take on a halo ring. These gleaming bands intersect twice, once under the center gem and again at the back of the ring. Dozens of glittering small round diamonds adorn these slender bands as they form this ring's unique silhouette, glittering in many directions. The focal point of this ring is a striking 8mm round pink topaz, a gemstone with a bold, feminine personality. While the color pink is often associated with little girls and fairy tales, in this ring it's completely grown up and glamorous. This outgoing stone is surrounded with a frame of additional round diamonds, for a total of 57 colorless glittering stones that perfectly offset the daring centerpiece of this ring. This is a piece that will never fail to add a pop of show-stopping color and eye-catching style. 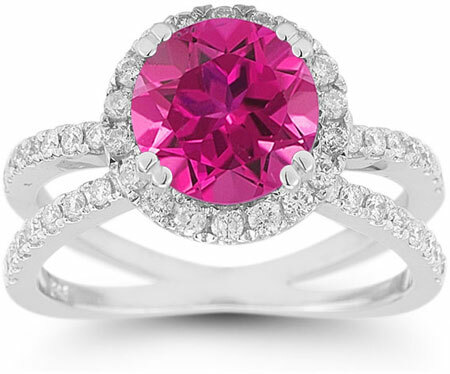 We guarantee our Pave Diamond Criss-Cross Pink Topaz Halo Ring to be high quality, authentic jewelry, as described above.